Normally I wait until August to take on the topic of rosé as it seems to be the case that people only want to drink this lighter version of red wine when the heat arrives but I ended up covering this a bit earlier this year as things have happened! Myself, I used to hate the wine because, as most winemakers admit, they make it just because people want to buy a cheap pink wine and little regard is given to the craft of the wine as long as long as it’s light in body and a bit sweet. There are however two main schools of winemaking when it comes to rosé and they sit on either side of the southern Rhône River. First is the Tavel style which is what most people probably know. Vivid salmon in color, the wine sees more contact with the skins during fermentation, has more body, and is generally the more popular style. The other style is from Provence which is incredibly light in color and sees little to no contact with the skins during fermentation. Residual CO2, red fruit, whipped cream, dark cherry, pomegranate, tart cherry in the mouth with persistent cream notes and a perk of acidity in the finish. While working on the second edition of my Vinologue Priorat book I had the chance to taste two very new DOQ Priorat wines from Scala Dei and Clos l’Asentiu. 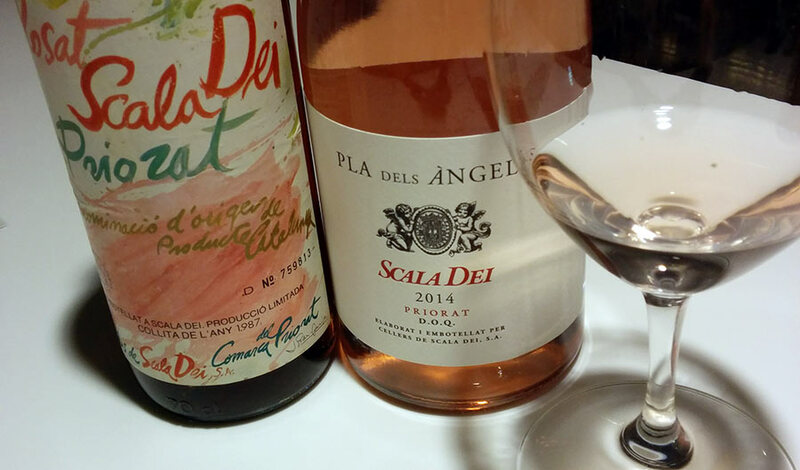 These wines are derived from 100% Grenache and show just how excellent rosé can be if the intent is to make a high quality wine and a gifted winemaker such as Ricard Rofes (Scala Dei) or Albert Costa (Clos l’Asentiu, Vall Llach) is at the helm. Floral notes of lily and violet along with rosemary currants, and peach. A fresh character overall with a great deal of depth. Named after one of the oldest residents in the village of Porrera, it holds aromas of grapefruit, sour cherry, fennel, slate, and orange blossom. Full and pleasing body with excellent balance and freshness. Both excellent, you can readily see that their price point is the same as a decent red wine. There is a reason for this in that they’re using their high quality, single vineyard grapes. In the case of Scala Dei, this was a move to revive their old line of rosé they used to make in the mid-80s that you can see above. Production was less than 2,000 bottles due to the hard 2014 harvest but they hope it will pick up a bit more this year. For Albert, it was something that was more of an experiment using a lined clay amphora to make all 800 bottles. As far as I know, he’s going to produce it again this year and perhaps a bit more. Like Pla dels Àngels, it’s also a tasty, lighter wine that is a tribute to one of the older women of the village of Porrera. Definitely worth checking out–if you can find it.